Even as the euro vs dollar inches towards our USD1.25 target the markets cannot seem to decide whether last week’s latest bailout and the creation of what is, in effect, EU debt union will ultimately save or destroy the common currency. Comments from Jeremy Batstone-Carr that “You cannot make any nation that is unable to service its accumulated debts more creditworthy by extending more credit! If the EU lends Greece money, the loan will increase that country’s public sector debt. The interest on the additional loan, whatever it eventually proves to be, will increase the public sector deficit. Total debt-servicing costs will rise, raising the burden on public sector cash flows. At some point in the future, the loan will have to be paid back.” just about sums up the present conundrum. From a technical perspective yesterday’s down bar, today’s desultory trading in a tight price range & tomorrow’s Ascension Day holiday which will see some markets closed, may simply lead to a period of sideways consolidation in the USD1.28 and USD1.25 region. 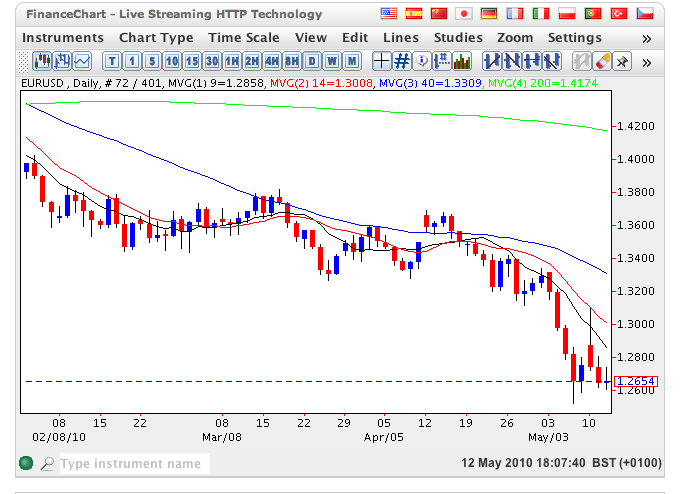 With four moving averages still pointing sharply lower, and with the 9 day in particular proving to be a resistant barrier to any recovery, short reversals are likely to be limited to USD1.28 at best with a retest of USD1.25 the most likely outcome in the short term. As has been said many times before should this price point be breached then expect a deeper fall even as far as USD1.20 in due course.